Your car uses a roof antenna to receive both AM and FM broadcast signals. This antenna is a removable type. To remove the antenna, turn the antenna counterclockwise. To install the antenna, turn the antenna clockwise. CAUTION: o Be sure to remove the antenna before washing the car in an automatic car wash or it may be damaged. 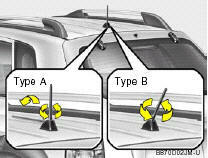 o Before entering a place with a low height clearance, be sure to adjust the roof antenna low. o In some vehicles, the antenna can be folded into only front position. o When reinstalling your antenna, it is important that it is fully tightened to ensure proper reception.